Aqua Plumb 1840030 is a 3-3/8" two-handle, polished chrome type "3" bathcock; with barbed spout for outlet. Polished chrome cross handles. Brass compression stems and replaceable seats. Solid brass body construction. Uses Price Pfister style replacement parts. Aqua Plumb faucets use standard, readily available replacement parts. Polyoxymethylene (POM) cartridge and waterways for AB1953 Ultra Low Lead Compliance. Comes packed in a shrink wrapped display box. 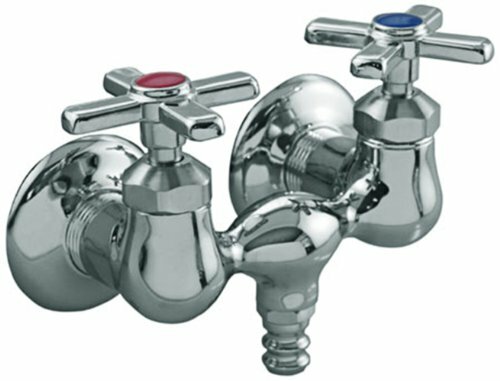 Aqua Plumb faucets meet all necessary codes and requirements including: IAPMO, UPC, cUPC, NSF, AB1953 and are ADA/Handicap approved. AB 1953 - Ultra Low Lead Compliant. Aqua Plumb is a registered brand of the Howard Berger Company. Limited Lifetime Warranty. If you have any questions about this product by Aqua Plumb, contact us by completing and submitting the form below. If you are looking for a specif part number, please include it with your message.